As easy as it is to accept my husband's chocolate preference, somehow, I just cannot get it into my head that my wonderful daughter-in-law, Holly, does not like dark or milk chocolate. That dear girl has had to put up with my offering her some kind of chocolate dessert for years...and I am grateful that she has not made me feel like a complete idiot each time I do it! Today's post recipe is an effort to apologize for all the times I forgot that my love for chocolate was not hers! In a mixing bowl, cream butter and sugars. Add the egg, rind and extract; mix well. 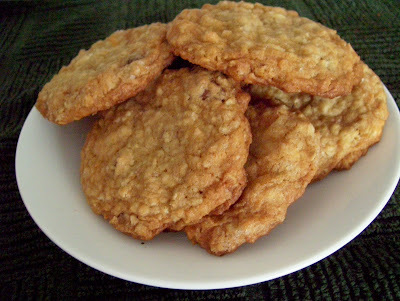 Combine oats, flour, salt, cinnamon and baking soda. Gradually add to creamed mixture. Stir in cooled, toasted coconut, chocolate and chopped nuts. 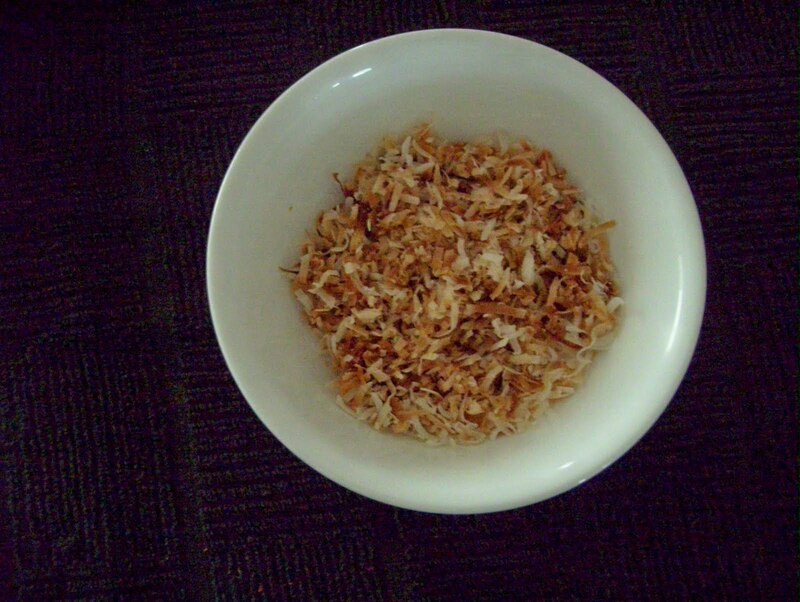 *Coconut can be toasted in the microwave very easily: Divide measured coconut into two parts. Put one part in a small bowl. Heat on HIGH for 1 minute. Stir after every 20 seconds. Watch carefully to keep from burning. Heat and stir at 10 second intervals as needed after the first minute. Set toasted coconut aside and brown remaining half following the same procedure. ** When possible, I remove, air dry and save the orange zest from any oranges we use. Pieces were soaked in water to soften, and chopped for this recipe to measure 1 tsp. I also used 1 tsp of the water I soaked the zest in for this recipe.